A Unique Case of Concurrent Long Bone Osteomyelitis and Empyema Caused by Fusobacterium nucleatum. S Waqas1, C Bannan1, A Fe Talento2, D Byrne3, S O’Connell1, S Clarke1, C Merry1. 1Department of Genitourinary Medicine and Infectious Diseases (GUIDe), St. James’s Hospital; Dublin. 2Department of Clinical Microbiology, St. James’s Hospital; Dublin. 3Acute Medical Assessment Unit, St. James’s Hospital; Dublin. We describe a patient presenting with constitutional symptoms, poor oral hygiene and leg swelling who was diagnosed with Fusobacterium nucleatum osteomyelitis of femur and empyema. Long bone osteomyelitis is rarely caused by this microorganism. 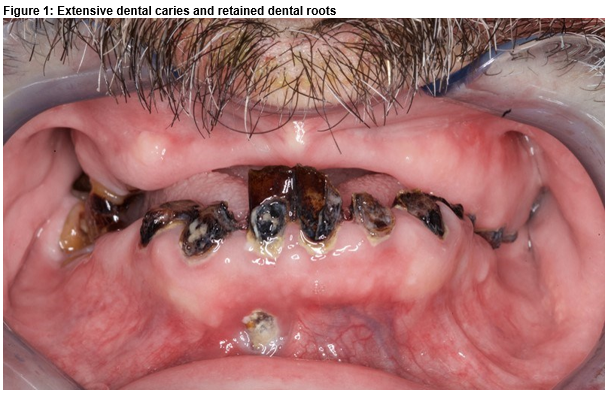 This unusual case was successfully managed with drainage and antimicrobial therapy. Fusobacterium nucleatum (F. nucleatum) is an anaerobic gram negative bacillus normally part of the orodental, colorectal and vaginal flora1. This is the first reported case of concomitant long bone (femoral) osteomyelitis and empyema caused by F. nucleatum. A 51-year-old male presented with pain and swelling of right thigh for 5 days preceded by intermittent fever and 8 kg weight loss over 9 months. Significant past history included previous alcohol excess, delirium tremens, seizures, poor dentition and he was an ex-smoker. He had not visited a dentist for 18 years and described dental trauma during previous seizure episodes. He was on regular levetiracetam and folate. Clinically the patient was afebrile, hemodynamically stable, clubbed, with remarkable dental caries (Fig 1) and had findings suggestive of left sided pleural effusion. His right thigh measured 5 cm more than the left in diameter and was warm and tender to palpation. Initial laboratory work-up revealed anaemia (Hb 11.5 g/dL), neutrophilic leucocytosis (WBC count 19.7 X 109/L, Neutrophils 17.5 X 109/L), thrombocytosis (576 X 109L), elevated C-reactive protein (276 mg/L) and D-dimers (2220 ng/ml) and hyponatremia (Na 117 mmol/L). Chest x-ray showed a left pleural effusion and dense consolidation in the left mid and lower zone. Blood cultures were not taken on admission. Working diagnosis was cellulitis and community-acquired pneumonia. He was given piperacillin/tazobactam along with therapeutic anticoagulation for suspected peripheral venous thrombosis which was later excluded on duplex. 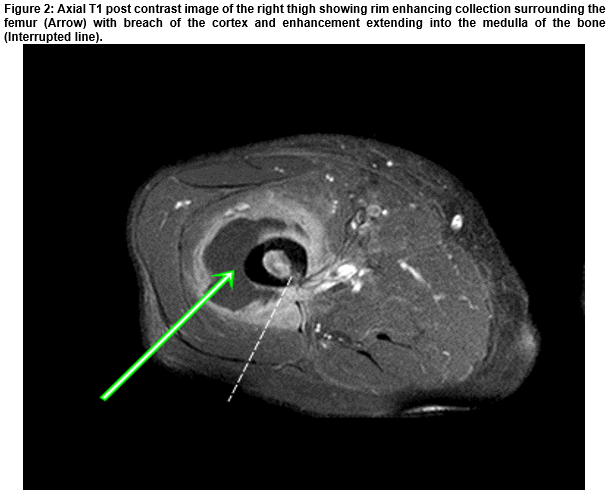 An ultrasound instead showed a 5.3 x 6.1 x 10 cm hypoechoic intramuscular collection within the anterior upper thigh suspicious of a hematoma. A loculated left pleural effusion consistent with empyema was confirmed on CT thorax. Tube thoracostomy drained 300 ml of pus. F. nucleatum was isolated on anaerobic culture which failed to grow for antimicrobial susceptibility testing. His antimicrobial therapy was changed to clindamycin and benzylpenicillin. Subsequently, MRI revealed osteomyelitis of the femur with surrounding oedema and abscess (Figure 2), which was drained 18 days after admission. The sample was sent to the PHE Identification Service (Colindale, England) since there was no growth on routine culture. 16S rRNA sequencing detected F. nucleatum. An echocardiogram excluded endocarditis. A unifying diagnosis of empyema and femoral osteomyelitis secondary to presumed dental disease by F. nucleatum was established. He was eventually discharged to the national OPAT (Out-patient parenteral antimicrobial therapy) program and arranged outpatient follow up with maxillo-facial department. He completed 8 weeks of intravenous therapy (benzyl penicillin, followed by ceftriaxone on OPAT) and oral clindamycin in total, with a further 6 weeks of oral therapy. The patient made a full recovery on follow-up. The three main types of osteomyelitis are osteomyelitis secondary to a contiguous focus of infection, secondary to vascular insufficiency or haematogenous2. Haematogenous osteomyelitis is rare in adults, most frequently involves vertebrae rather than long bones and anaerobes are infrequently implicated, commonest species being Peptostreptococcus and Bacteroides spp.2,3. Within the anaerobic genus Fusobacterium, two species, F. nucleatum and F. necrophorum, are the most commonly isolated pathogens4. F. nucleatum has been associated with oro-dental infections, brain abscesses, endocarditis, soft tissue infections, Lemierre’s syndrome, and very infrequently with bone and joint infections particularly outside the cranial region in immunocompetent patients1,5-7. It is most likely that this patient first developed aspiration pneumonia followed by monomicrobial pleural empyema, with concurrent or subsequent bacteraemia but it is also possible that both arose directly from dental disease, without aspiration. Studies have reported evidence of emerging resistance of some Fusobacterium spp. isolates to penicillin and clindamycin, thus our choice of combination empiric treatment with β-lactams and clindamycin6. Another alternative was using a combination of β-lactams and metronidazole as Fusobacterium is usually susceptible to metronidazole8. Combination therapy was chosen considering reports of mortality with F. nucleatum bacteremia4. Antibiotic duration was prolonged because inadequate treatment of F. nucleatum empyema has been associated with empyema necessitans and cure from F. nucleatum osteomyelitis has been reported with treatment duration of 12 weeks6,9. This case highlights the importance of looking for other sites of infection when F. nucleatum is isolated from one focus of infection and anaerobes should be considered in the differential diagnosis for distant site long bone osteomyelitis especially in patients with poor dentition. 1. Consent was obtained from the patient for clinical photography and for submission of case report. 2. Con O’Donovan, OPAT nurse St. James’s Hospital; Dublin. 3. Roisin O’Connor, Pharmacy department St. James’s Hospital; Dublin. 4. Dr. Jennifer Murphy, Radiology Registrar, St. James’s Hospital; Dublin. Dr. Sarmad Waqas, Infectious Diseases Department, St. James’s Hospital; Dublin. 1. Denes E, Barraud O. Fusobacterium nucleatum infections: clinical spectrum and bacteriological features of 78 cases. Infection. 2016;44(4):475-81. 2. Lew DP, Waldvogel FA. Osteomyelitis. Lancet. 2004;364(9431):369-79. 3. Brook I. Spectrum and treatment of anaerobic infections. J Infect Chemother. 2016;22(1):1-13. 4. Afra K, Laupland K, Leal J, Lloyd T, Gregson D. Incidence, risk factors, and outcomes of Fusobacterium species bacteremia. BMC Infect Dis. 2013;13:264. 5. Han YW. Fusobacterium nucleatum: a commensal-turned pathogen. Curr Opin Microbiol. 2015;23:141-7. 6. Lee MJ, Ha YE, Park HY, Lee JH, Lee YJ, Sung KS, Kang CI, Chung DR, Song JH, Peck KR. Osteomyelitis of a long bone due to Fusobacterium nucleatum and Actinomyces meyeri in an immunocompetent adult: a case report and literature review. BMC Infect Dis. 2012;12:161. 7. Lewis RP, Sutter VL, Finegold SM. Bone infections involving anaerobic bacteria. Medicine (Baltimore). 1978;57(4):279-305. 8. Veloo AC, van Winkelhoff AJ. Antibiotic susceptibility profiles of anaerobic pathogens in The Netherlands. Anaerobe. 2015;31:19-24. 9. Hockensmith ML, Mellman DL, Aronsen EL. Fusobacterium nucleatum empyema necessitans. Clin Infect Dis. 1999;29(6):1596-8.